I am super excited to share with you my completed quilt top flimsy for the Midnight Mystery Quilt Along. Because of my fabric choice (batiks), the block arrangement, and the addition of the diamond borders, it reminds me of the beautiful tile work found in Morocco. That's why I'm calling it "Moroccan Tiles." This quilt top is huge coming in at 96" x 96." I was originally thinking that I would have someone long arm quilt it for me, but now I'm on the fence thinking I might want to try and do it myself on my Babylock Symphony. I've had a few friends in my quilt guild offer to let me learn how to long arm on their machines so I might take them up on it and then try and tackle this. Finishing up the borders was my February goal for the One Monthly Goal project so I'll be linking up here. Having these monthly goals is really helping me to stay on task and get projects done. It's beautiful! I love how the borders came out! Congratulations for meeting your goal. It came together beautifully and looks fantastic on your bed - the drape is awesome. Beautiful finish for this top! What ever you decide for the quilting it will be beautiful. Congrats on meeting your goal. Beautiful choices for color and fabric. The borders are very nice too! Have fun with the next step! Cingrats on your OMG! Yes, I see exactly what you mean about its resemblance to Moroccan tiles. Great finish! I love, love the border you added! I is such a great compliment to the quilt top and looks wonderful on the side of your bed. Very exotic. Could very well be out of a casbah! Truly a stunner Diana! The colors are perfect. 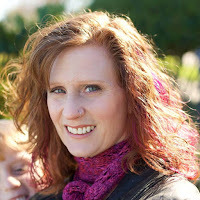 What a great opportunity your friends have offered you, to learn to longarm! It looks great all finished! Love how you added such a nice border to your quilt! The borders really complete the quilt and I love the calming color scheme. 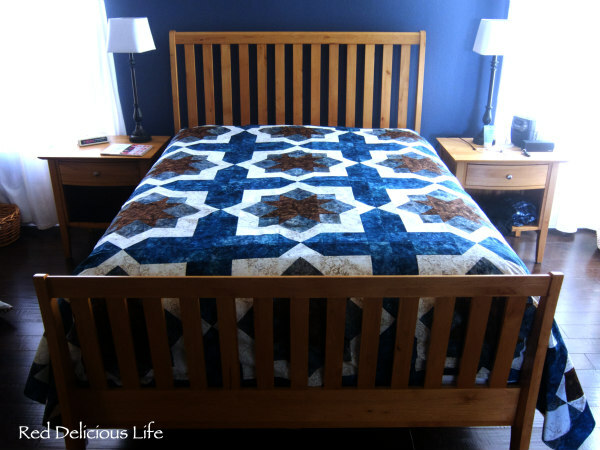 Also, perfect way to stage this quilt in the bedroom with oak furniture - it really sets it off! It's beautiful and I love the addition of the borders! 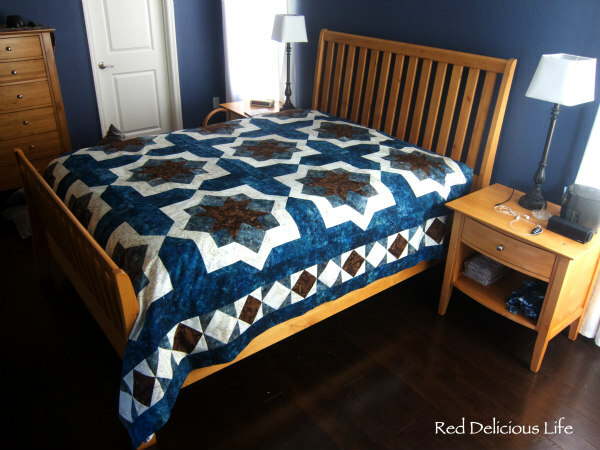 That is a really gorgeous quilt, you can be rightly proud of it! I concur with the many comments praising your border treatment. Outstanding! The border creates a very special "frame" for the beautiful center blocks. The rich colors of your fabrics also make this quilt sing.